There’s a tantalizing bit of drama that could play out on the final day of the April 25-27 NFL Draft in downtown Nashville, one possible scenario that has captivated the imagination of football fans. And, also there’s a Music City connection. More specifically, a Vanderbilt connection. Typically, rounds four through seven flow at a furious pace as teams choose largely unheralded players, and the highlight of those latter-round picks is the selection of “Mr. Irrelevant,” the 254th and final name to be called. 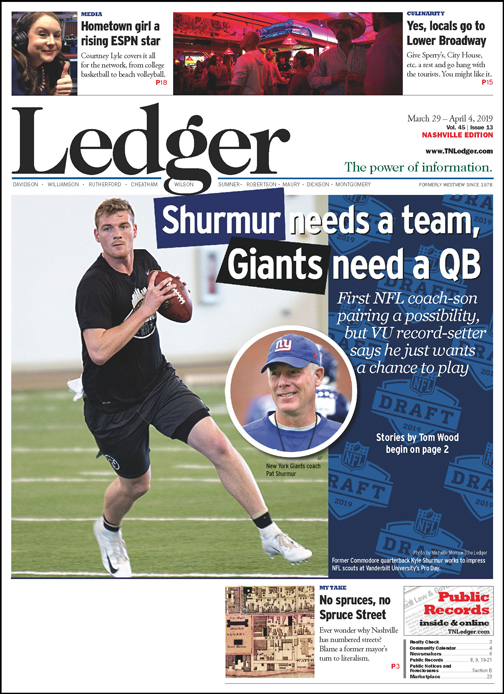 But this year’s late-draft intrigue already being offered by fans and media experts filling out mock drafts involves former Vanderbilt star quarterback Kyle Shurmur and his father, Pat, head coach of the New York Giants. By most accounts, the Giants are shopping for a franchise quarterback in this draft, someone who will eventually replace aging veteran Eli Manning. New York has both the sixth and 17th picks of the first round, and most Giants-watchers say the team will use one of those to select from Ohio State standout Dwayne Haskins, Duke’s Daniel Jones or Missouri’s Drew Lock. But the Giants have stockpiled a dozen draft picks over seven rounds through trades and compensatory picks. That being the case, would the Giants, if he is still available, use one of those picks to select the head coach’s son? If so, it would be an NFL first. Predictions have the Vandy quarterback going anywhere from the sixth round to later or not at all, in which case he still could be signed as an undrafted free agent. But Shurmur just wants a chance to show what he can do at the next level, whether it’s with his father’s team or their fiercest rival. 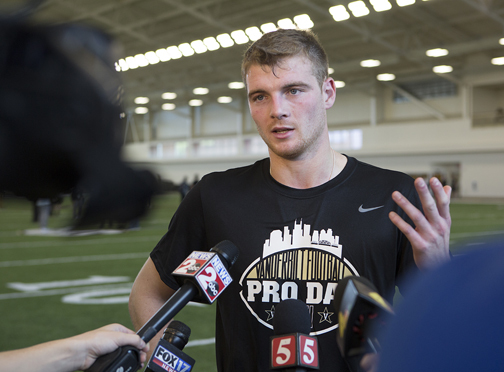 “I’d appreciate any opportunity I get,” Shurmur said after he and his draft-eligible teammates completed Vanderbilt’s recent Pro Day workouts in front on more than 50 scouts from 30 NFL teams and one from the Canadian Football League. “The Vanderbilt quarterback, well, I’m extremely proud of him,” New York Giants head coach Pat Shurmur said in evaluating his son’s performance at this year’s NFL Combine. Shurmer’s Giants need a quarterback to eventually replace the aging Eli Manning. The record-setting Vandy quarterback was invited to the NFL Combine in Indianapolis in early March, where he got to spend quality time with his father at dinner and show off his ability on the field. Coach Shurmur was indeed a proud papa after watching how his son conducted himself that week. Pat was a little more candid with Sports Illustrated about Kyle’s chances to make an NFL team this fall. And a chance, Shurmur reiterates, is all he wants. 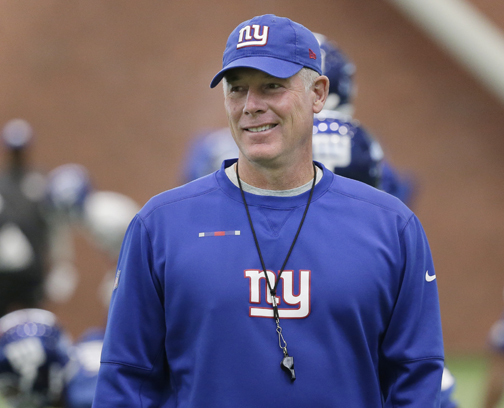 “I’m just going to go out here and prepare as hard as I can, be as focused as I can, and compete as hard as I can, and everything will take care of itself,” Shurmur says. While there will be plenty of draft-day speculation in Nashville on where Shurmur will land, don’t look for him to attend the draft himself. Instead, he’ll likely be on the golf course or on the Jersey shore with his mother, Jennifer. But with a grin, Shurmur admits he’ll keep an eye on draft developments. 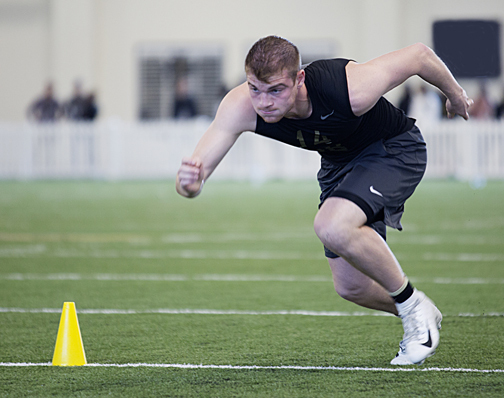 Vanderbilt quarterback Kyle Shurmur showcases his speed at Pro Day. Jennifer, as much a fixture at Vanderbilt games as she was at Giants games, says Kyle will be aware of draft-day happenings wherever they are. “He will have his cellphone very close to him,” she says. “It won’t be out of eyesight. I’m just going to try to keep him busy, keep myself busy, to just not worry why the phone hasn’t rung or whatever. “So, we’ll go golfing, I’ll take him to the shore, we might go fishing a little bit, again to keep everybody busy or not dwelling on why the phone hasn’t rung, or when it’s going to ring, or whatever,’’ she adds. Since graduating from Vanderbilt in December, Shurmur has focused on getting ready for the NFL draft, the combine and team visits. He’s been rigorously training at the EXOS “human performance” facility in Pensacola, and is represented by agent Tom Condon, the former Kansas City offensive lineman-turned-agent who represents NFL quarterbacks Drew Brees, Eli Manning, Matthew Stafford, Matt Ryan and Alex Smith, as well as Texas defensive end J.J. Watt. That meant cutting out distractions. It’s been a fun process so far. I’ve got a few more months to prepare (for NFL camp),” Shurmur says. “Growing up, I always looked at the mock drafts and projections and stuff. But this year I’ve deleted some social media, get off the internet and started reading books more, just trying to get away from all that stuff because I feel like it will drive you crazy. Jennifer acknowledges the family has discussed Kyle’s football future – and the possibility that Pat could someday wind up coaching Kyle. “He was a leader in every sense of the word,’’ Vanderbilt Coach Derek Mason says of Kyle Shurmur, his starting quarterback for three and a half seasons. “Of course, it would make it easy for me,” she says with a laugh, then adds, “There would be two sides to that coin. It would be great because we wouldn’t have to travel to a different location to watch Kyle play. It would be easier on my travel expenses. And Jennifer isn’t concerned about the family’s football future – even if it’s a hot topic for others. “Listen, any opportunity Kyle gets, he’ll give that team 100 percent and we would expect that,” she points out. “But Kyle would expect that if Pat’s coaching against that team, Pat would give 100 percent, you know, each for their victory. In four seasons as Vanderbilt’s starting quarterback, Shurmur set records in nearly every passing category. He finished his career with 64 touchdown passes, completing 723 of 1,273 attempts for 8,865 yards. He also became the first quarterback to lead the Commodores to three consecutive victories over rival Tennessee since the 1920s. But those numbers compiled against Southeastern Conference powerhouse defenses don’t necessarily mean success at the next level. At the combine, like every other invited player, Shurmur was measured, questioned, tested and analyzed on and off the field. The pros love his size (6-foot-4, 230 pounds), his understanding of the pro game and leadership abilities, but they question his mobility and arm strength. NFL.com analyst Lance Zierlein points out a number of Shurmur’s strengths and weaknesses. He’s an “upper-body thrower” who “plays with some lower-body stiffness in setup and operation,” Zierlein says. Those were some of the issues Shurmur hopes he addressed at Vandy’s pro day when he completed 48 of 50 attempts. He sprayed passes all over the field — left, right, across the middle, down and out. A couple of deep balls were floated to receivers, but others he hit in stride. The Giants had two scouts among the 50 at Vandy’s pro day, while the Titans were represented by coach Mike Vrabel and general manager Jon Robinson. Scouts cagily gauged talent and spoke in guarded tones when asked about Shurmur. “He can help some teams,” says Rex Hogan, the Indianapolis Colts vice president of player personnel. Vanderbilt coach Derek Mason thinks Shurmur has all the tools to not just play but someday star at the next level. “He knows how to work. He’s played under center. He knows how to play from the pocket. He understands West Coast offense, he understands how to control the game from the line of scrimmage,” Mason says. “A lot of quarterbacks haven’t done that in their career, so I think he’s a ready-made quarterback for the NFL. Vanderbilt’s top draft pick this year is expected to be defensive back Joejuan Williams, who declared for the NFL draft following his junior season. Like Shurmur, he was at the combine. Most NFL observers see Williams being selected on the second day of the draft in the second or third round. Williams says he received a draft grade in the top two rounds from the NFL committee. NFL Network draft analyst Daniel Jeremiah currently has Williams ranked No.47 on his overall board. Attending the pro day workouts was Hunter Hillenmeyer, a former Vandy linebacker drafted by the Packers in 2003 but who made his mark with the Bears from 2003-10. “I think you feel like what you do out here on a field like this is going to make or break you, but that’s very much not the case. This is just one small data point for somebody who’s played as much football as Kyle or any of these other guys have,” Hillenmeyer explains. And that’s what matters to Shurmur, the journey toward earning an NFL roster spot. “I think we’ve prepared hard here and I’ve done everything possible to put myself in position to compete and put my best foot forward,” he says.